The right shower accessories can improve safety by making it easy to enter, exit, and maintain balance throughout your shower. Moen has made a name itself by preventing unpleasant incidents in the bathroom, some expect the best. 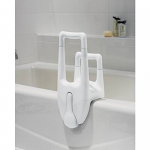 Sportaid has a broad collection of Shower Accessories from Moen that provide maximum security and safety like the Moen Dual Tub Grip Handles, and more. Browse through our collection of Moen Shower Safety Accessories below or feel free to call 1-800-743-7203 for expert assistance. And remember our Low Price Match Promise, you really will come out a winner big time. Sportaid customers report as much as 20% on Moen Shower Safety Accessories savings at Sportaid! Equip Your Bathroom with Moen Shower Safety Accessories to Avoid Unexpected Mishaps! Choose from our lightweight and durable selection of Shower Accessories, and be the best you can be by choosing Sportaid as your Shower & Bath Products supplier. Whether this is your first visit to Sportaid or you have been shopping here for years, we guarantee satisfaction. After over 25 years in the business helping people find the right Moen Shower Safety Accessories at the lowest prices, we continue to lead the industry! We carry a large selection of wheelchair cushions, wheelchair parts, and wheelchair accessories. We are capable of beating any competitor's advertised price, just call! Our customer service staff has over 50 years of experience, plus over 90 years of combined wheelchair use experience. We look forward to working with you!